The decision of whether or not to work is one many moms have to make. They may need to return to work after taking maternity leave because they need the money, or they may be able to stay home with their kids if they so decide. One thing is for sure, though—raising kids is very expensive. A lot of moms might want to stay home with their children the first few years (if possible), but then want to return to their jobs. 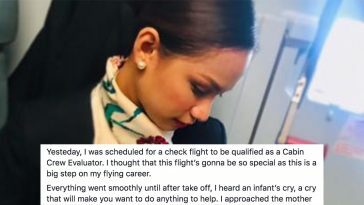 It’s really a personal decision and one that’s very much dictated by a mom’s financial situation as well as how career-focused she is. And a woman can care about work as well as kids; it doesn’t have to be one or the other. 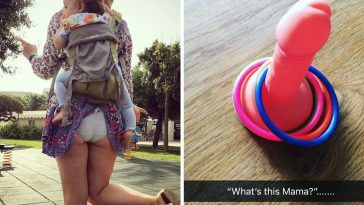 There are obviously pros and cons to both being a working mom or a stay-at-home one. It’s not easy to simplify. 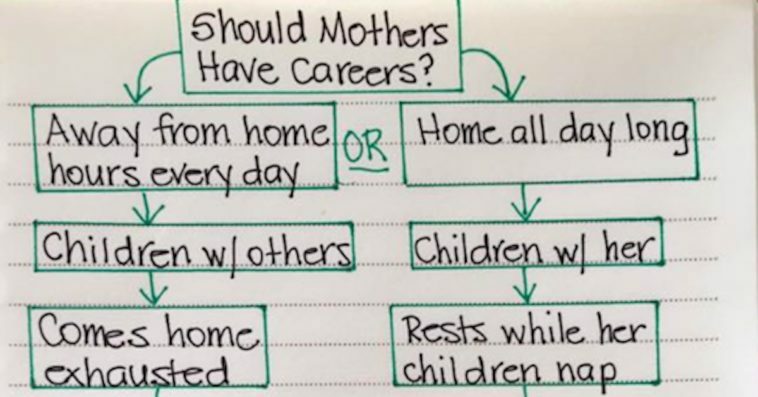 That’s why this simplistic hand-written chart posted on Facebook is causing so much controversy online—because it compares working moms unfavorably to stay-at-home moms without providing any sorts of actual facts or data. This chart is so stupid. It makes all kinds of inferences about the lives of working moms as opposed to those of stay-at-home moms. It doesn’t take into account any outside factors and it lumps allll working moms into one group and alllll stay-at-home ones into another. What mom has enough energy for intimacy with her husband “frequently”? Even a stay-at-home mom has been busy all day with kids. And I assume with the cleaning and shopping, too, since she’s not doing it on the weekends, according to the chart (another ridiculous notion). The page where the chart was posted, The Transformed Wife, is a Christian page, and the writer has strong opinions about the place of women in the world. 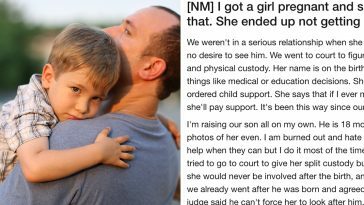 But the bible never said anything about moms having to stay home instead of work, or about the quality of care received by children with working moms. The chart is, of course, being dragged into the middle of next week on Facebook, where tons of people have posted comments. Pretty much everyone agrees it’s idiotic, stay-at-home moms and working ones alike. I’d love to see this “perfect” woman described in the stay-at-home mom category—her house is so clean she doesn’t have to spend time cleaning on weekends, and she has time to cook a nutritious meal from scratch every night. But I don’t think she actually exists.